I read elsewhere that a meta-analysis of articles comparing low-carb diets to “balanced” diets did not find large differences in weight loss between those two diets. The study is “Low Carbohydrate versus Isoenergetic Balanced Diets for Reducing Weight and Cardiovascular Risk: A Systematic Review and Meta-Analysis“. The first thing to note is that the compared diets are isocaloric or isoenergetic, a fact detrimental for the low-carbohydrate diets. And the unfavorable effect exists because low-carb diets are more satisfying, so they naturally help reduce caloric intake compared to other diets. By forcing an isoenergetic intake in the diets that advantage is lost. Apart from that, using the term “balanced” seems pretty unscientific to me because this term means “a diet that contains adequate amounts of all the necessary nutrients required for healthy growth and activity“. Are low-carb diets not balanced? Looking at Figure 3 of that study we see that despite being isoenergetic diets and against the (false) notion that the only thing that matters is the total caloric intake, diets low in carbohydrates always produce greater weight losses, except in two studies that are coincidentally from the same authors (with minor differences in the list of authors). If the total calories consumed in a diet, regardless of their origin, determine body weight changes, how is it possible that diets low in carbohydrates always cause more weight losses than isocaloric diets with more carbs? Simply because the idea that all calories are equal is false. But there are two studies that are out of the norm. As we will see next, the data shown in Figure 3 presumably obtained from these studies are false. (B) Diet II (low fat: 1500 kcal / day, 52% carbohydrates, 20% proteins, 27% ​​fats). 38% of 1507 calories is 573 calories, i.e. about 143 g of carbohydrates. That’s the diet they call “low carbohydrate”, but that is not a low-carbohydrate diet. And even if the authors of the meta-analysis say it is, their results can not apply to people who follow real low-carb diets. 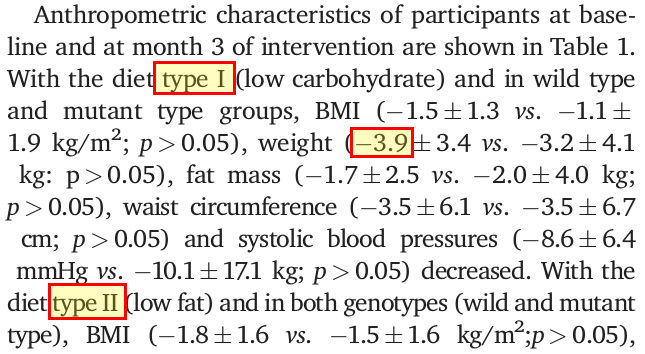 But in any case in this study (see figure below), after three months, those on diet I lost 3.4 kg, while those on diet II lost 4 kg. In the first case from 93.8 to 90.4 kg, and from 91.5 to 87.5 kg in diet II . The difference between these two high-carbohydrate diets is only 600 grams. But group I weighed 2.3 kg more at the baseline than the other group so the difference in the final weight is 2.9 kg. However, in the meta-analysis the authors convert this difference of 600 g between two high-carbohydrate diets in 2.9 kg, because they make the nonsense of comparing the final weight ​​of the participants, regardless of the fact that one of the groups weighed significantly more than the other one at baseline. Diet I low in carbohydrate provided 1507 kcal / day (38% carbohydrates,26% proteins and 36% fats). Diet II was low in fat and provided 1500 kcal / day (53% carbohydrates, 20% proteins and 27% fats). But now the results are obtained for people with a particular variant of a gene (just read the title: Evaluation of weight loss and adipocytokines levels after two hypocaloric diets with different macronutrient distribution in obese subjects with rs9939609 gene variant), so the results can not be extrapolated to the general population. The second line of the abstract informs us that this variant has been associated with a high risk of obesity. That is a difference of 800 g, which the authors of the meta-analysis convert to 3.4 kg in Figure 3 by using again the final weights of the two groups. the data shown in Figure 3 of the study does NOT match the data contained in the two articles by De Luis et al. Data in Figure 3 are false. Studies from Luis et al. compare two high-carbohydrate diets, although they call one of them a low-carbohydrate. The name does not change the facts. I have not analyzed the remaining articles included in Figure 3 of the meta-analysis. Finally, in Figure 4 of the meta-analysis the results for studies of longer duration (1-2 years) are shown. 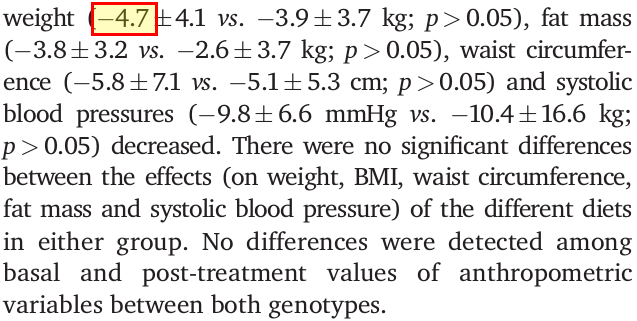 In this case 4 articles show better results in weight reduction for “balanced” diets than low-carbohydrate diets. Among them I focused on a couple. First Sacks 2009, the most significant in the comparison. In the first page of the article we see that weight reduction in global terms was higher in diets with 35% carbohydrate, when compared with diets with 65% carbohydrates. A loss of 3.4 kg compared to 2.9 kg for 35% and 65%, respectively. 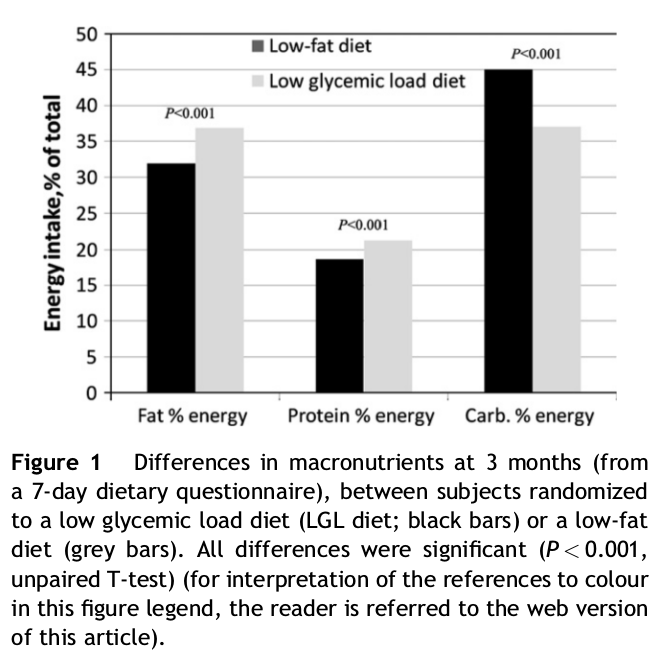 Out of curiosity I also looked at the Klemsdal 2010 study , a one year duration study in which the diet of the participants was monitored at 3 months and as you can see the low glycemic index diet (which is not the same as low carbohydrate) had about 37% of calories from carbohydrates. That’s not a low carbohydrate diet. But after the “third month check” they did NOT know what the subjects were eating. “A 7-day dietary questionnaire was obtained at 3 months.” And that’s it. Not only the diet was not a low-carb diet: we don’t even know if the subjects were following it. Since the diet was never a low-carb diet, I think it’s irrelevant to know to what extent the participants abandoned the diet. The meta-analysis concludes that both approaches (low-carb and “balanced” diets) are equally valid for weight loss and for good health. What data really say is that when two diets high in carbs are compared, the one with slightly less carbs gets slightly better results. But I disagree that we should consider this meta-analysis to draw conclusions, because the data shown to us are false. It seems that the only scientific article (of the 19 reviewed) that considered a real low-carb diet was Lim 2010, but the subjects went from 12.4% carbs to 40% after 15 months. Therefore the obtained results do not correspond to a low-carb diet. 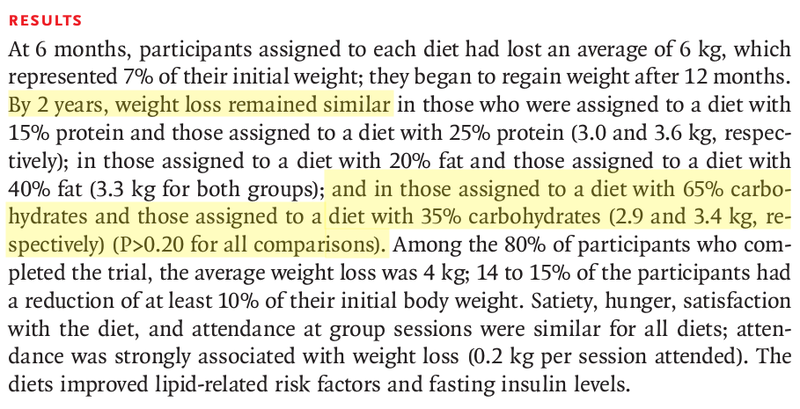 The mess is huge because after 15 months the low-fat group was eating 30% of calories from fat, not the wished 12.5%. Can someone show me studies where low carb was more effective then balanced diet where protein was matched? Also concerning genetics, wouldn’t the probability of people having more effective results be dependant on their own individual genetics, lower carb or higher carb being more effective for different individuals. Unfortunatly when people say one way fits all I just phase out and lose interest in their authority. Like Tim Noakes or Jeff Volek, very intelligent, but cherry picking information, hence why Alan Aragon took the legs out from under him at the NSCA conference. No one size fits all, if people think that, they need a slap of reaality. I am sorry but I don’t understand your question. What do you call a “balanced” diet? A balanced diet is a diet that contains adequate amounts of all the necessary nutrients required for healthy growth and activity. Are you implying that low-carb diets do not contatin adequate amounts of all the nutrients we need? May be you’d find this interesting. And have a look at diets 3 and 4 and their results in this study. Bad science will be used against good people. Noakes and Harcombe have taken that paper out and analysed the 13 remaining papers where they corrected a long list of data errors they found. Their analysis shows that Naudé’s study actually favours low-carb. Harcombe and Noakes have done just that in a re-analysis of the Naudé Review detailing all the errors. Their study has gone through the peer-review process and a journal has accepted it for publication.